T’ao Ch’ien is the granddaddy of Chinese dropout poets; dropping out not for political reasons, or as any kind of protest, but rather because he couldn’t tolerate court and office life; preferring poverty and subsistence farming amid the Great Transformation to unsettled ambition and material abundance. Dropping out and moving with his family (wife and two or three kids) to a small house in the 5th century boondocks allowed him direct access to the great Earth’s multitudinous processes of change, an ancient concept dubbed “the Great Transformation”, which coupled with a personal philosophy of letting everything come as it may provided him with - (not happiness exactly) - a nearly transcendent inner freedom. To assist himself in the settled waiting required to tap into these processes, he drank wine, and wrote about drinking wine while drinking wine. He loved his wine! But as the introduction makes clear, he typically drank just enough to “loosen up” and break down habits of mind. Many of his poems were obviously begun with no fixed intention of where they would end up; a characteristic I’ve noticed (and admired) in many old Chinese poets. Spontaneity clearly was key. T’ao Ch’ien will begin a poem in a good mood, become sad and disconsolate, then perk up at the end when he thinks of wine:I couldn’t want another life. This is mytrue calling, working fields and mulberrieswith my own two hands. I’ve never failed it,and still, against hunger and cold, there’sonly hull and chaff. I’m not asking for morethan a full stomach. All I want is enoughcommon rice, heavy clothes for winter andopen-weaves for the summer heat – nothingmore. But I haven’t even managed that. O,it can leave you stricken with grief.And character is fate. If you’re simple-minded in life, its ways elude you. That’show it is. Nothing can change it. But then,I’ll delight in even a single cup of wine.He was also capable of simple light-hearted joy, a low-key euphoria abetted by autumnal sadness:In a meager home, guests rare, I oftenforget I’m surrounded by turning seasons.And now falling leaves fill courtyardemptiness, I grow sad, realizing it’sautumn already. Fresh sunflower thicketsfill north windows. Sweet grains in southfields ripen. Though I’m far from happytoday, I know next year may never come. "Get the kids together", I tell my wife,"it’s the perfect day for a nice long walk. "There’s quite a bit in these poems that reminds me of the pre-Socratic philosophers – a primitivism coupled with a sophisticated, clear-eyed grasp of tremendous concepts in unadulterated, simplistic form, while making tangible the feel of the planet beneath individualized ancient feet. T’ao Ch’ien is one of the humble immortals. I believe that Tao Yuanming was a very strong individual, I mean i think at the beginning he did not want to work for the government I saw it more as like a pass down job to him by his relatives it was like he had to do it like if he owed it to someone. As more I read I realized how hard it might have been for him working in a place were he did not want to be I mean the people loved him and had a great respect for him, but it was not something that Tao wanted to do. I felt good when he finally decided to leave the job he was at. When he retired finally after all the thought he put into it after ll the tragic events he went through from the death of his sister for example. having time for him and his family and to be with his children something that he finally wanted to do. The poem that impact me the most or the poem I can say I related was the one returning to live in the farm or something like that I cant remember of the top of my head, any ways I say that I can relate to it because I could read the joy he had to going to a place where he enjoyed. It is like me when I get home and realize I have no homework and on my day off at work I can finally relax. (Who am I kidding I am a college student I will never have time to relax completely) Any way I wish I could just sit down with a glass of wine like Tao Yuanming did and just write my life away. Maybe one day! I don't know about the translation into English, but I loved his words! The last ones about dying and the grave were particularly poignant. Tao Yuanming David Hinton - Tao Qian, also known as Tao Yuanming, was a Chinese poet of the Six Dynasties period and is generally regarded as the greatest poet during the centuries between the Han and Tang dynasties. He is also the foremost of China's "recluse" poets, or the poets who seem to have written their greatest work while in reclusion and/or those poets in whose poems the theme of countryside solitude particularly resonates.In Tao Qian's poems can be found superlative examples of the theme which urges its audience to drop out of official life, move to the country, and take up a cultivated life of wine, poetry, and avoiding people with whom friendship would be unsuitable, but in Tao's case this went along with actually engaging in farming. Tao's poetry also shows an inclination to fulfilment of duty, such as feeding his family. Tao's simple and plain style of expression, reflecting his back-to-basics lifestyle, first became better known as he achieved local fame as a hermit. This was followed gradually by recognition in major anthologies. 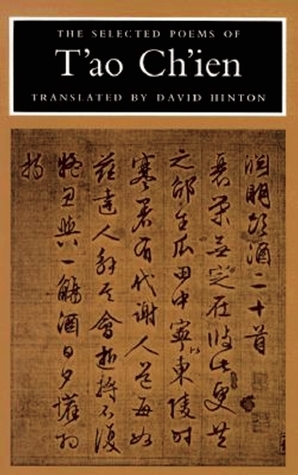 By the Tang Dynasty, Tao was elevated to greatness as a poet's poet, revered by Li Bai and Du Fu.Han poetry foreshadowed some of Tao's particular symbolism and the general "returning home to the country" theme, but his poems, prose and style broke new ground and became a fondly relied upon historical landmark. Much subsequent Chinese painting and literature would require no more than the mention or image of chrysanthemums by the eastern fence to call to mind Tao's life and poetry. Later, his poetry and the particular motifs which Tao exemplified would prove to importantly influence the innovations of Beat poetry and the 1960s poetry of the United States and Europe.